The annual appointment with Cosmoprof Worldwide Bologna 2018 has just ended and for the occasion we presented a big news: the innovative Parlux ALYON®. 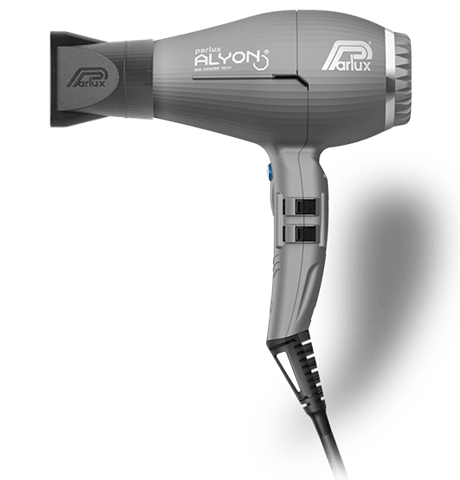 Parlux ALYON® is the new reference for professional hairdryers, designed to offer professionals the maximum in terms of performance, light weight, long life and usage without limiting in any way the creativity of the hairdresser. The new Parlux ALYON®, more powerful than ever, is a combination of technology and innovation in every detail. The heart of this great little jewel is its motor: with a duration of 3,000 hours and an air flow rate of 84 cubic meters / hour, the new professional K-ADVANCE PLUS® motor is designed to guarantee superior professional performance, providing power at the highest levels; it is capable of sustaining continued use in stressful work environments without having any power loss. The strength of this new Parlux hair dryer model is the NEW VARIABLE GEOMETRY RESISTANCE having an ideal power of 2,250 Watts, with optimization of the heating areas for an even more uniform dispensed temperature. 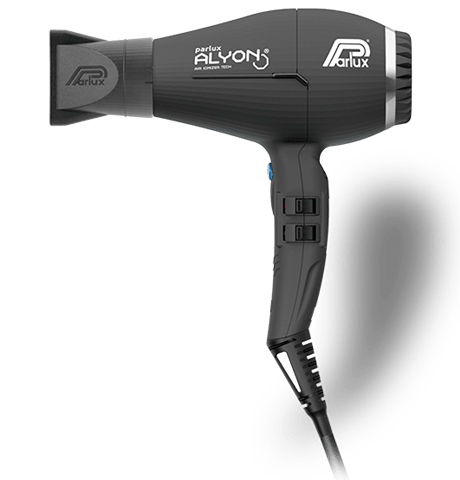 Last but not least, an indispensable device for the hairdressers: the “AIR IONIZER TECH", the exclusive ionizer system has been measured to optimise the emission of negative ions eliminating static electricity, making the hair softer and shinier while speeding up drying time. Ergonomic, balanced and very light, thanks to the redesigned handle, to the optimization of the balancing and to the lightening of all its components, the revolutionary pride of Parlux is comfortable to use both for the hairdresser and for the most demanding consumer. Attention to quality and not only: Parlux has always given value to design and style that must express well-being and joy in every hair salon. 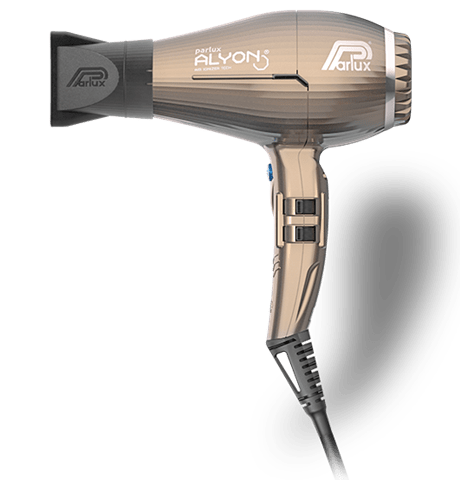 The new Parlux ALYON®, in fact, thanks to its futuristic design with "prismatic" shape, gives a touch of originality to the hair dryer which perfectly fits into the modern style and design of most prestigious hair salons. The new Parlux ALYON® is attentive to fashion, too! Available in 8 brand new trendy colours, it is suitable for all tastes. You can choose from: yellow, pink, coral, green, turquoise, bronze, matt graphite, matt black. Parlux keeps faith with its ECO-FRIENDLY PHILOSOPHY that provides recyclable raw materials and packaging, low noise pollution, no harmful emissions and super-fast drying for energy savings. 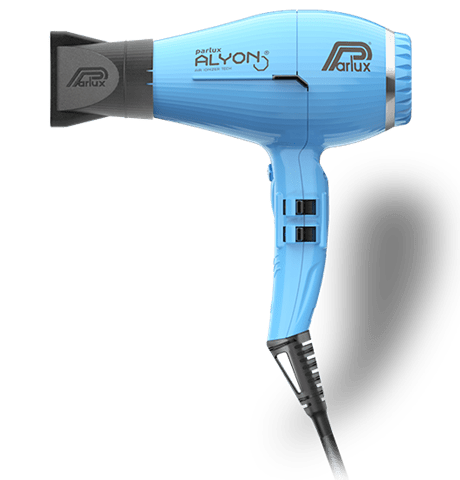 Parlux ALYON® is already a legend: a real aspiration for hairdressers all over the world.